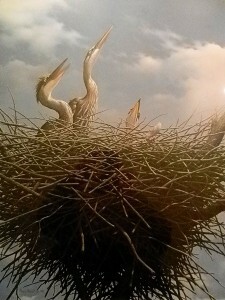 In honor of the Missisquoi National Wildlife Refuge’s 50th birthday in 1993, Nancy Howe, Vermont artist and winner of the 1991-92 Federal Duck Stamp Contest, created a painting entitled “Baby Blues.” The artwork features three Great Blue Heron young in their nest. Nancy spent one day in a blind in the Refuge’s heron rookery. She observed and photographed the birds to get material for this painting. Signed and numbered prints are being offered by the Friends for $50. 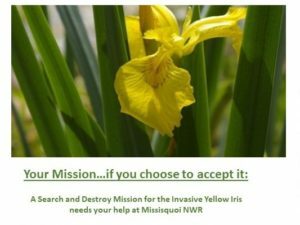 Purchase of a print includes a 1-year membership in the Friends of Missisquoi. Consider giving a print as a holiday gift to a special bird-lover or nature-lover. 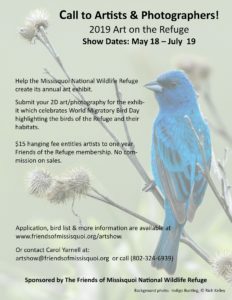 Prints can be pi cked up at the refuge, ordered via the Friends website, or use the order form below. If ordered by mail or via the website, prints will be sent in a mailing tube. Shipping is free! 19” x 24” signed and numbered print by artist Nancy Howe. Bi-Monthly board meeting of the Friends’ Board of Directors. Members are always welcome to attend. Find out what the board is doing and bring your ideas!